"From childhood I have been aware I had a Great,great uncle who was an African Explorer. He had been the first white man to cross Maasai Teritory and come out alive and had a waterfall and a gazelle named after him. It was an ambition to follow in his footsteps and when three years ago I learnt that a Kenyan wanted to organise a walk following part of Thomson's Maasai Land Expedition, I wanted to take part. The man concerned, Ezekiel Katato, turned out to be a Maasai Elder from a village Thomson passed through during his expedition. Ezekiel had learnt about Thomson at school. It became his ambition to organise a walk covering the section of the expedition that passed through his home area, from the edge of Amboseli National Park to his village, Kilonito, a distance of about 75 miles. At the end of May 2014, I arrived in Nairobi to join a group of Dutch members of Masterpeace, whose support had made the walk possible. It was an amazing experience, Ezekiel is an excellent organiser. A group of around 60 people, from Holland, Japan and Britain guided by young Maasai men and women with a full supported team ensuring smooth passage over the six days of the walk and a game drive in Amboseli. We visited several schools during the walk and camped in the grounds of four of them. This gave us the opportunity to spend time with the children and it is something I would like to do more in future. The Maasai proved to be extremely friendly and hospitable and it was a privilege to walk with them through their environment. So far the Maasai have managed to preserve many of their traditions. Many of the young Maasai accompanying the walk are at College or University, but are still actively involved with their villages and their culture. Ezekiel is Executive Director of "Across Maasai Land Initiative", (now the Olakire le Maa Trust) a non-profit organisation working to promote and support maximum utilization of locally available resources and assets for sustainable livelihoods of the Maasai people in Kenya. One of the main thrusts of their work is Girl's Education to attempt to break the cycle of early arranged marriages and help women become more proactive in their culture. Ezekiel aims to develop the Walk as a way of increasing awareness of Maasai Culture and encouraging tourism through the links with Joseph Thomson's travels in Maasai Land. He sees this initiative as Maasai led, but with the encouragement of the Thomson Family and supporters. Ezekiel's respect for Thomson is demonstrated by this photo of a sign he placed on the walk route. The spelling might not be 100% but that doesn't detract from the sentiment. This is a wonderful example of a local organisation trying the improve their world themselves. It is one I will do my best to support. 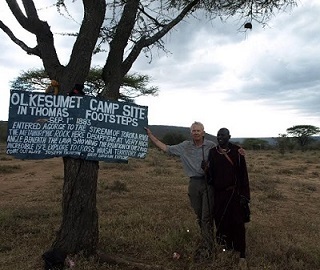 The 2015 walk saw John Hastings Thomson return to Kenya, accompanied by Maggie Green, Great-grand-niece of Joseph Thomson and Jane Harlow, a friend who is now a trustees of the Joseph Thomson Maasai Trust along with Maggie and John. Mark Smith of the Herald newspaper did an interesting and indepth article on this walk. At this year's AGM, the decision was taken to only open the Centre on Saturdays (2.00pm - 4.00pm) during July and August until further notice. For entry outwith these times, please click here to contact us. Please see our events page for further information. You can find the Post Office in the Joseph Thomson Room within the Centre on Wednesday and Thursday afternoons between 2.00 - 4.00pm. If you are looking for any heritage information please do not hesitate to contact us by clicking here. We are planning to show some of the local films made by our Chairperson, Sophia Harkness during March 2018 and are also planning a talk by Hugh Buck, our secretary on his time in Kenya in the 60s. this will be introduced by Sophia. Please check out the Forthcoming Events page for further information by clicking here. We welcome individuals, groups and school parties. Please contact us to arrange your booking. Would you like to help this Centre continue and flourish? 2. Donate/loan materials to our archives. 3. Help fund running costs by becoming a friend.